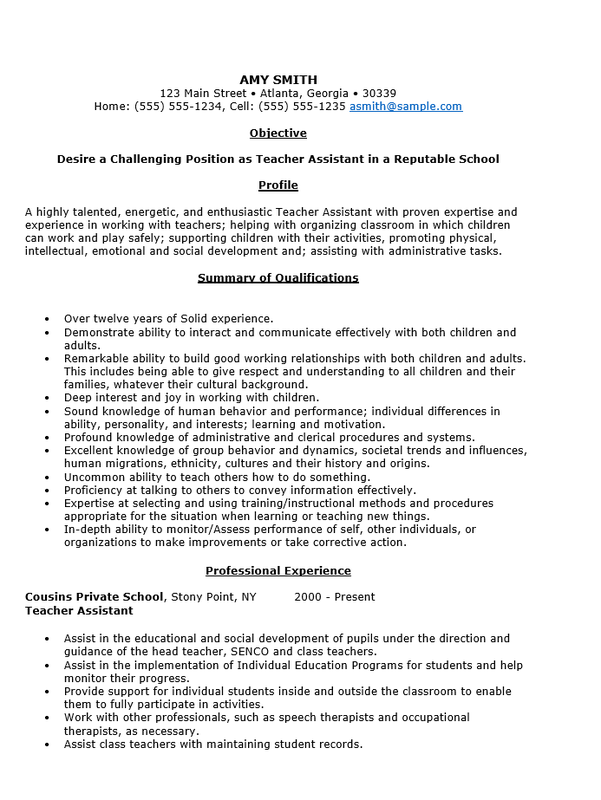 The Assistant Teachers Resume Template organizes the vast amount of information that a teacher’s assistant must present in a resume for a competitive job hunt. Assistant Teachers may be found everywhere from high schools to universities. They must provide support to teachers in administration, teaching, and grading. This can be a very demanding position and when presenting a resume, candidates must be able to show their value. This requires a very organized document containing a wealth of information delivered in a seamless and direct fashion. This is particularly important since most educational hiring managers will be inundated with resumes that must quickly be categorized before being able to have closer look at viable candidates. Some preparations job seekers can make before settling down to fill out the sections in the assistant teacher’s resume template is to gather all their information in one place, make sure their credentials are in order, and to make an outline of their skills. Regardless of these preparations, it is important to clear a good amount of time in a schedule to compose this document. 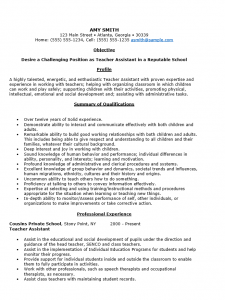 The goal of the assistant teacher resume template is to gain the applicant an interview but this can only be achieved if it is a professional document in both style and content. Step 1. Enter your name and contact information. Ideally, your name should be in a larger font. Step 2. Write one or two statements. This statement (or statements) should be a declaration of your intention, the reason for presenting the resume, and/or how you would envision yourself functioning in this position. Step 3. Write a synopsis of your professional identity and place this in the “Profile” section. Step 4. The “Summary of Qualifications” is an important section. This will be a showcase of your skills, accomplishments, and what you are proficient in. Word this in an attractive manner that addresses the general requirements of a Teacher’s Assistant and the specific requirements in the job listing. Step 5. The “Professional Experience” section is where you report on your previous employers, their location, the dates you worked for each one, and the job title for each position you held. This should be followed by a summary of what you accomplished there (in a bullet list). Step 6. The final section of this template is the “Education” section. This is where you should list your academic credentials. List where you studied, the degree you earned, and the year of graduation. If you earned any notoriety or honors list this beneath each entry.